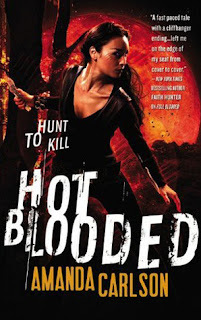 It’s an action-packed ride in this second installment of the Jessica McClain series. The story begins with our heroine chomping at the bit to save her mate and things do not slow down once between the first page and the last. First off, let me say that if you haven’t read Full Blooded, I urge you start there. This book is a continuation of that one –and while this has a self-contained mission, it all hinges on the events of the first installment. There is a little bit of backstory mixed in, but not much. Basically, the entire book is about Jessica’s journey to rescue Rourke from the clutches of the evil Goddess Selene, who kidnapped him. She takes along her brother and one other wolf –along with her human nemesis and general PITA Ray– plus two vampire guides names Eamon and Naomi. Their path is full of traps and landmines laid out by Selene. As Jess overcomes one after another, she (and we) learn more about her strengths as a Lycan, and what that means in relation to the prophecies about her. Here’s the thing, though. I liked the book, but didn’t love it the way some of my fellow reviewers did. It’s well written; the pacing is good; the world-building is solid. But I don’t feel an emotional connection to the characters. I like them. But I don’t feel their feelings. Yes, I know Jess wants to get Rourke back, and thinking about him makes her wolf run in circles, but I don’t feel a crushing weight or fear of a life without him. (Frankly, their time together as mates lasted about as long as a sneeze, so maybe that has something to do with it.) It’s not just about Rourke, though. It’s deep feeling for anything, everything. Her thoughts and feelings are intellectually conveyed to me, but it’s missing that intangible thing that makes me feel like I am not only inside Jessica’s head, but her heart. It is a good read, though. It kept me interested and invested in how it would all play out. And Amanda Carlson does a great job laying the groundwork for the next battle ahead. It looks like another exciting ride. I felt the same way about this one. I liked it but I didn’t like as much as Full Blooded. I agree with the mate thing too. They haven’t spent enough time together to have true feelings for each other. I hope they get more time together in the next book. Ray is growing on me, especially after this book. I automatically assume there’s gonna be insta-mates whenever I read a werewolf book so it didn’t really bother me but I can understand your point of view. I don’t mind insta-mates with wolves as much as with non-shifters, but I would like a chance to see something more develop, KWIM?